The Dodgers pulled off a blooper for the ages tonight against the Padres. Let's go over it slowly and appreciate how terrible it was. In the sixth inning, with one out, Padres catcher René Rivera flied out to Yasiel Puig. 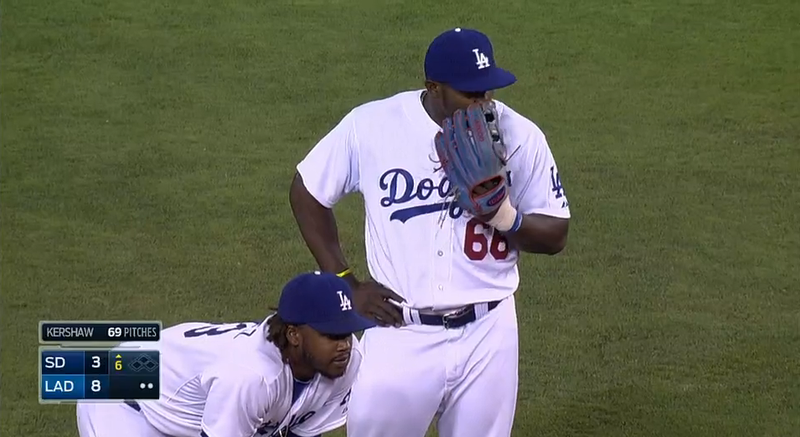 Puig saw Rymer Liriano drifting off the bag at first and tried to double up. His sucky throw was the first error, moving Yangervis Solarte to third. Liriano then went for second base, as catcher A.J. Ellis's throw sailed into center field for the second error. Solarte started for home and Liriano took third. Hanley Ramirez tried to get Solarte out at home, but his throw was dreadfully off. Third error! Finally, Liriano went for home, and while Ellis's throw to Clayton Kershaw was accurate, Kershaw avoided Liriano so he wouldn't get hurt. I don't blame you, Clayton. An injury on that play would have been the dumbest and worst thing ever. It wasn't worth it. The Dodgers still won, 9-4.